A 1924 John Hacker designed gentlemans racer. 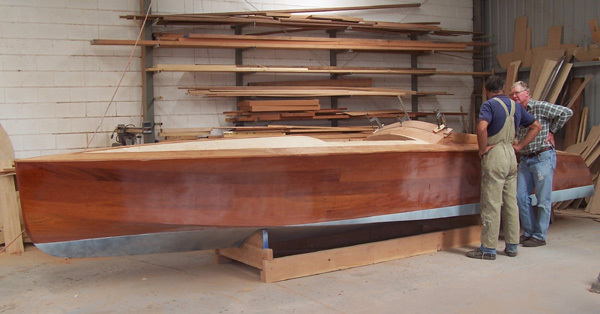 The Sydney Wooden Boat Festival is a place of inspiration. Even if the weekend is cold, wet and windswept just as it was in March last year. My work collegue, Tim Heaney and I had driven up from Paynesville for a fun time playing with the Chriscraft we had restored the year before. The owner had encouraged us to display the boat at the festival and the opportunity for a blast around the harbour ensured our attendance. There is nothing on the water as beautiful as a combination of mahogany, chrome and leather being propelled by the hearty rumble of a V8. We were in heaven. Until the rain set in. And set in it did. 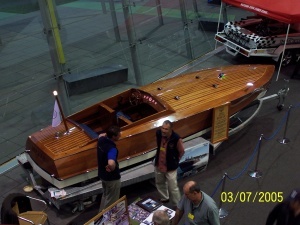 So we talked boats with the other woodies. Only the keen would stand around in the rain. One bloke who did stand out was Paul Dewhurst from Golden Era Classics in Lake Maquarie displaying his monster new 27' Ventnor racer. He could talk boats. Size does matter. So do numbers. He told us he had 8 boats in build at his factory and invited us to visit. This we had to see. 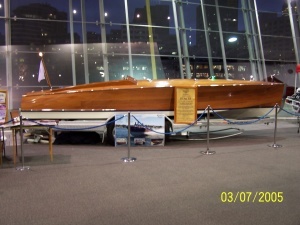 Building vintage US designed mahogany speedboats in Australia and then selling them in the US is a real coup. He was generous with his time, advice and offers to help with the sourcing of materials or components. Enough of this repair and restoration lark, we were inspired. All we needed to do was find the right design. Trawling the internet was of little success. 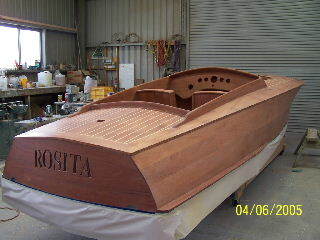 A US Wooden Boat design by Nelson Zimmer closed the gap, but when thumbing through a 1938 edition of US Motor Boating the lines of "ROSITA" just leaped from the page. loft the lines. The sorer our knees got the more we lusted. Already I was blasting down the lake with the wind in my hair. We just had to build her. They did things differently in 1924. But John Hacker's art and craftmanship have endured those eighty years. The opportunity to build this stunningly beautiful design using modern wood epoxy technology and then power her with a small V8 weighing less than the original 4 cylinder Schrepps motor was just too tempting. For some blokes a mid life crisis involves a sports car and a blonde. For others it is a red truck and a wooden speedboat. And maybe a blonde. g to accept the flared lines so exquisitely drawn by the late John Hacker. This makes for a very strong and rigid construction and proved very successful with the Chriscraft we had recently restored. The topsides have only one stringer between sheer and chine and are skinned with one laminate of the same plywood as on the bottom. 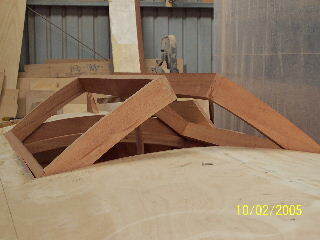 Again we were able to skin in sheets except at the bow where once again those curves called for cold molding. 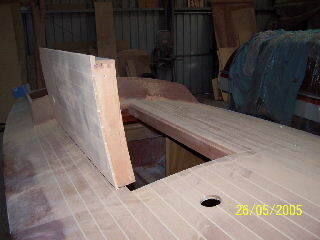 Next we lined out plank runs and deep cut brazillian mahogany boards for book matching the outer skin. 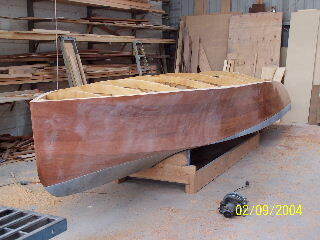 Planks are epoxy bedded and temporary fastened. This is just plain good fun. So too is the marinizing of a brand new Chev 305 V8. It all takes time but there were bills to pay and paying jobs to do. 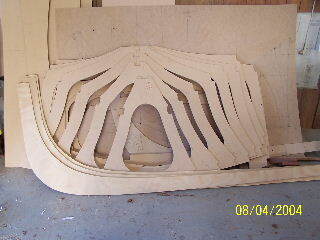 Once planked, the torture board fairing of the hull took its toll. 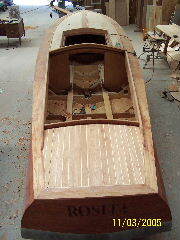 Still, shaping a mahogany speedboat is a lot more pleasant than some of the onerous tasks we boatbuilders undertake. 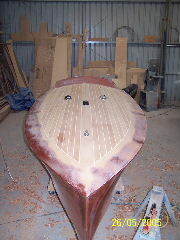 Deck framing and plywood sub deck were fitted and then the mahogany coverboards and kingplank followed once the cockpit frame was installed. Now we could sit in the boat and dream. And dream we did, often with brmm brmm sounds eminating from ones mouth as we built the stylish paneled seating. Steering and engine controls were also engineered and fitted for ergonomic use. 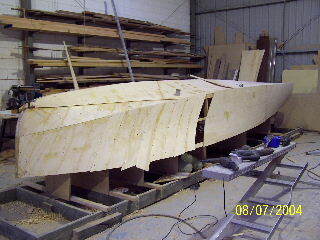 The engine, skeg and shaft were then dry fitted and then removed after a trial launch to check the waterline. We were plaqued with set backs on the pattern making and casting of our almost patented concealed engine bay hinges. The scuppered dove tailed engine hatches and concealed hinges are a class apart and were well worth the wait to get right. 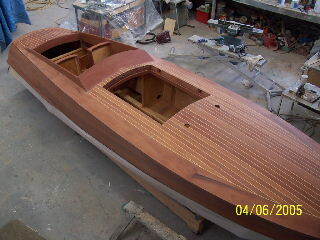 Patience is something most boatbuilders have in short measure and I guess we fit the bill. 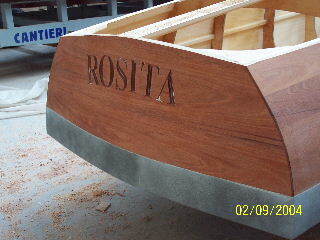 See the pictures of the finished project under Rosita Launch in the Events folder and in Boats For Sale.